Facebook and Snap Inc. are two of the most desirable companies to work for in all of tech. The two companies have a storied history. Like Facebook, Snap Inc.—which began as Snapchat—was founded by a young college student with a pulse on what his fellow students wanted to see from a new social platform. And also like Facebook, Snap Inc.’s young founder passed up on acquisition offers—including an infamous $3 billion offer from Facebook themselves—in favor of building “the next big thing” on his own. Today, Facebook and Snap Inc. compete for the attention of users. Instagram—a subsidiary of Facebook—directly competes with Snap Inc. in the image sharing and live streaming marketplace. New features on Facebook, such as “Facebook Live,” have also encroached on Snap Inc.’s market share. *Note: Salaries are accurate as of publication and are updated on our salaries page with the most current data. According to Paysa data, the average salary for Facebook employees is $204,000 per year. That includes a $139,000 base salary, $17,000 annual bonus, and an impressive $48,000 in annual equity. Comparatively, Snap Inc. salaries come in slightly higher than Facebook salaries. The average employee here can expect to earn $216,000 per year. However, that doesn’t necessarily mean it’s the better opportunity: the average base salary of $121,000 and annual bonus of $14,000 at Snap Inc. are actually lower than at Facebook. It’s the annual equity that puts them over the edge. Snap employees earn an average of $81,000 in equity each year. For the more risk-averse candidate, Facebook is still likely the better option. However, if you can afford to lose a bit in your base salary, the long-term earning potential at Snap Inc. could be much higher. At Facebook, product managers earn a reputable salary well above the national average of $125,000 per year. Facebook product manager salaries total out to an average of $233,000 per year, including a $167,000 base salary, $21,000 annual bonus, and $46,000 in equity each year. 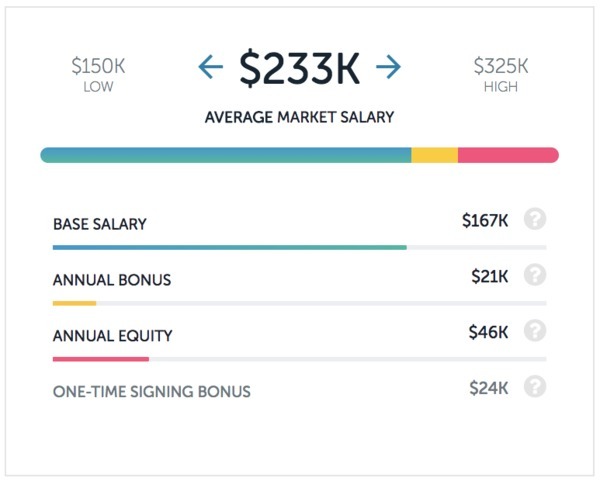 But, that salary pales in comparison to what product managers can earn over at Snap Inc. The average salary for a product manager at Snap Inc. is $336,000 per year—more than $100K more than you’d make at Facebook. Again, however, you need to have the stomach for risk to make the opportunity worthwhile. The base salary for the position is $148,000 per year which, while above the national average, is below what Facebook offers. 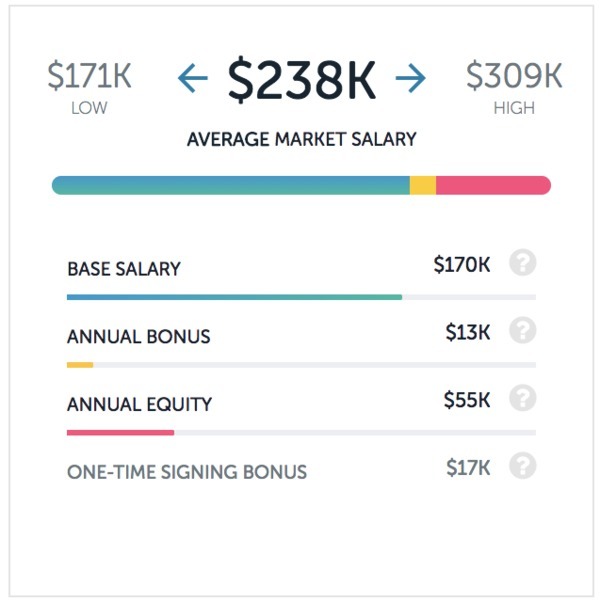 The annual bonus at Snap Inc. is slightly higher at $25,000 each year, but it’s the equity where you’re set to make some big money. Product managers can expect $163,000 in annual equity if Snap Inc. continues to impress investors. 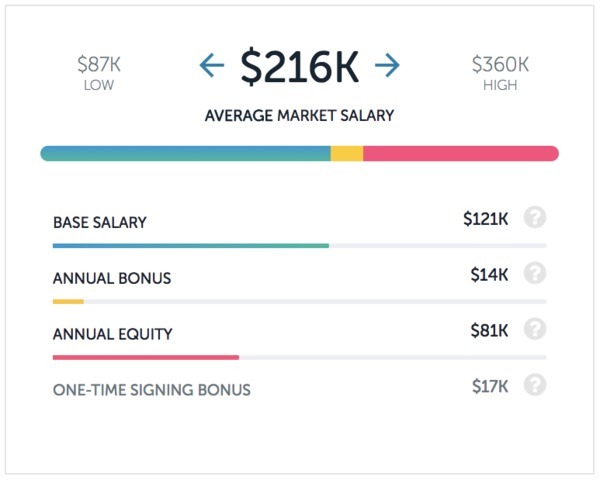 Average salary for a product manager at Snap Inc. The relatively recent development of this position has created a talent shortage that’s catapulted data scientist salaries over the past few years. Both companies pay exceedingly well for the right candidates for this position. At Facebook, data scientist salaries average $198,000 per year, which includes a $144,000 base, $16,000 bonus, and $39,000 in equity. Snap Inc. takes the cake again here, however. 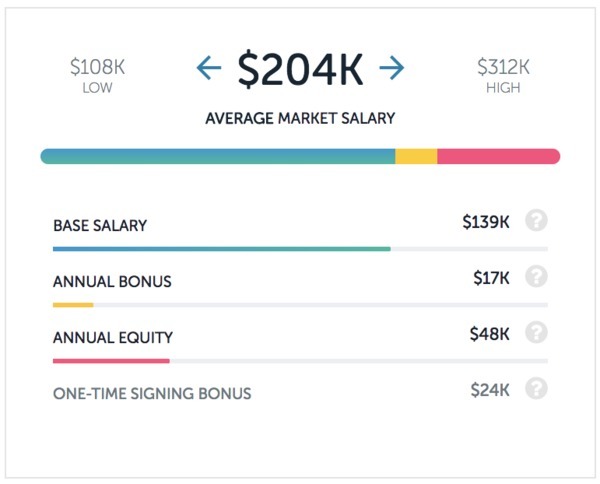 The average salary for a data scientist at Snap Inc. is $238,000 per year, including a $153,000 base salary, $10,000 bonus, and $71,000 in annual equity. 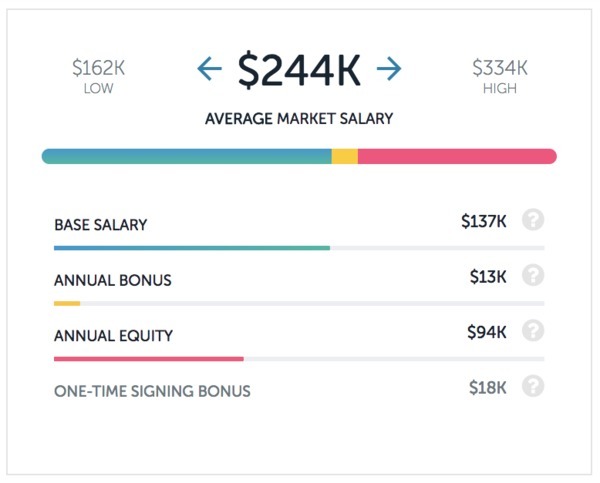 Average salary for a data scientist at Snap Inc. This is the first instance where the Snap Inc. opportunity seems better overall. Not only is the annual equity considerably higher, but the base salary at Snap Inc. is better than Facebook, too. Of course, Facebook offers a number of employee perks that might sway your decision, but overall, Snap Inc. offers a better compensation package for data scientists. Here’s a position that’s pretty neck-in-neck for the two companies. Software engineer salaries at Facebook average out to $224,000 per year, including a $152,000 base salary, $15,000 bonus, and $56,000 in equity. Snap Inc. pays slightly higher with an average software engineer salary of $244,000 per year including a $137,000 base salary, $13,000 annual bonus, and $94,000 in annual equity. Like most of the other comparisons, you’ll need to weigh the equity versus the base, but this role shows fairly comparable salaries at both companies. 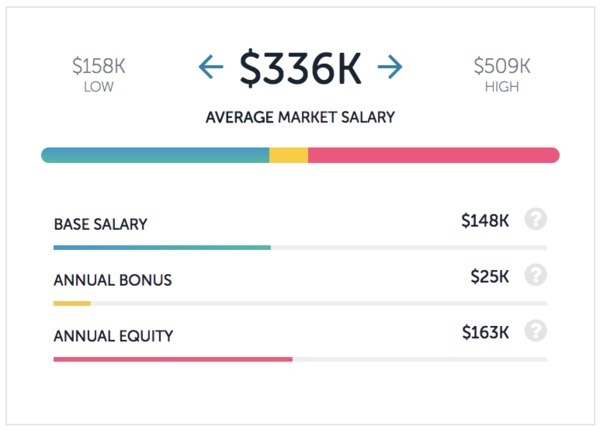 Average salary for a software engineer at Snap Inc.
For the more risk-averse, Facebook offers a safer bet when it comes to salaries. Snap Inc. comes with more risk, but potentially much higher reward. Either way, both companies have a lot to offer top tech talent. Want to see how Facebook stacks up against other top companies? Check out our blog for comparisons between Facebook and Pinterest and Facebook and Google. Please note that salaries in this article are current as of its publication date. To view the latest and greatest salary data, check out our salaries page. You can also sign up to personalize Paysa for customized career matching based on your unique skills. Previous ArticleHave You Asked What Your CoWorker Makes?